Illustration from George H. Kerr’s Okinawa – the History of an Island People, plate 16, after page 262. This Okinawan tribute ship was sketched by a British artist who was on a British ship visiting Naha, Okinawa, during the early 1800s. 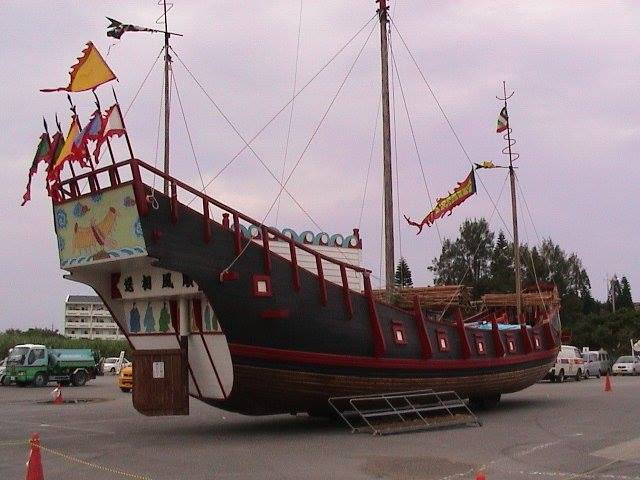 As you can see, it looks like a Chinese junk. It probably was. Quite magnificent, I must say. So are the trading ships in the photos below. I have been listening to a beautiful Okinawan song, “Imi Shijiku” by Ayano Uema (see the video below), for some time. I love the beautiful sound of her sanshin (3-string instrument). I didn’t know what the title and the verses meant until my friend sent me the lyrics and English translation (see lyrics below). Watch the video, and watch her as she sings. Then play the video again while viewing the lyrics. What comes to mind when you follow the lyrics as you listen to Ayano sing? I’ve been to Okinawa only three times — the first in 1968. For some strange reason, this song by Ayano takes me back there, to a time not in the present but in the distant past. What comes to my mind when listening to this sad song is that for several hundred years, beginning in the late 1300s, the Okinawans sailed the seas and traded with other countries like China, Japan, Korea, Malaysia, Vietnam, and the Philippines as well as other countries in the South China Sea. It was this trading that made Okinawa prosperous back then. Usually, a trip on a sailing ship would take a year or two. The ships would sail with the wind and return when the wind blew in the opposite direction. But I’m sure many Okinawans who sailed on these voyages were lost at sea or somehow perished, never to return. I wonder how many Okinawan young women watched their lovers sail away and spent months waiting for them to come back? How often did they go to the shore to scan the ocean in the direction from where their loved ones would return? How long did they wait when they failed to return? Did they wait year after year until, with a sad heart, they finally reached the point where they felt they would never see them again? What was going through their minds? What was the feeling in their hearts after many years had gone by? And so it becomes, in time, “A thing of the past, now long-ago.” This is the image that my mind conjures. My aunty Ruchan told me that her grandmother’s father was a sailor on an Okinawan tribute ship that sailed to China. She said that he was killed by Japanese pirates when they attacked their tribute ship. Aunty Ruchan’s grandfather, grandma’s husband, is my Baba’s (grandmother’s) brother. They were from Oyakawa village in Haneji (which is where my Inafuku family is from also). Haneji is in north Okinawa next to Nago city. In 1433, on the return leg from India in the fleet’s 7th world voyage, Chinese Admiral Zheng He died. China decided then that the 7th voyage would be the last of its Grand Fleet voyages. From then on, China decided to not only prohibit any more Grand Fleets but to also prohibit any of their ships from trading with other countries. (Regardless, many Chinese merchants and traders along China’s southern coast did anyway.) The Chinese government felt that everything they needed, they already had in China. In this sense, China became isolationists. What the Chinese government did allow, though, was Okinawan trading ships, which carried cargo between China and other countries. It was through this arrangement that Okinawa prospered. At the end of Zheng He’s Grand Fleet era in the early 1400s, Okinawa began sailing the China Seas not only for themselves but for China as well. China gave many of their ships to Okinawa for their trading. Okinawa’s trading ventures lasted until the 1800s. For hundreds of years, Japanese pirates (and probably Chinese and South Asian pirates too) preyed on trading ships sailing around the China Seas. 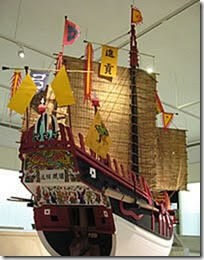 The Japanese pirates normally left the Okinawan ships alone, but there were times when they didn’t. One of those times was the Okinawan tribute ship that aunty Ruchan’s great grandfather was on. Here are four pictures of Okinawan trading ships. The first is a picture of an Okinawan tribute ship sketched by a British artist who was on a British ship visiting Naha Okinawa during the early 1800s. As you can see, it looks like a Chinese junk… probably was. Quite magnificent I must say. So are the trading ships in the next two photos. This entry was posted in Biography, Haneji, History, Images, Japan, Minyo, Singer, Uema Ayano. Bookmark the permalink. 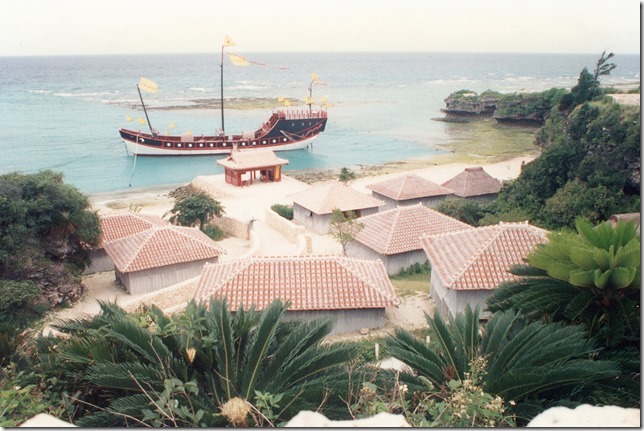 The last picture of the ship in your blog is from a picture I have seen near Murasaki Mura and from the docu-drama Ryukyu no Kaze. The location of the set is in Yomitan-son near Hotel Nikko Alivila. I have stood in the recreated receiving house located on the shoreline next to the boat. It is a beautiful site to see. The melodic song of Uema Ayano took me there even though my feet find me in Florida today. Songs of Uchina tend to do this to me, especially from Miss Uema. Ooh. Neat. I was just about to ask where we can find such ships today. I would love to get a closer look, in person, at such things.